Pure Oasis Flow review | What Hi-Fi? The Oasis Flow is weatherproof. It's splash-resistant. It's made from aluminium and has bouncy rubber seals. If it's a radio that's up to being carted into the elements you're after, this is it. Pure's proprietary ChargePAK battery is integrated, and it's good for up to 10 hours' listening. 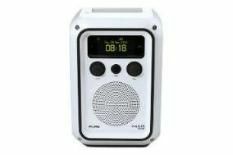 As well as wireless internet radio access, this will stream from a wireless network and tune to digital and FM radio broadcasts, and it has a 3.5mm input. The OLED display is clear, and operation is via touch-screen controls and rubberised rotaries. This is a tenacious machine, stable with its wi-fi and FM connections, and a piece of cake to operate even in brightly lit conditions. When playing Paris's divine FIP radio station via a wireless network, it's a poised, zesty and likeably forward listen. What it isn't, is particularly clear. Perhaps it's a by-product of the Oasis Flow's construction, but there's a shortage of top-end extension that takes the shine off music, and a cupped-hands-as-a-megaphone quality to voices in the midrange. All of which means that, while the Flow's great if you insist on putting your radio on the edge of the pool, it comes up a little short in pure sound quality.